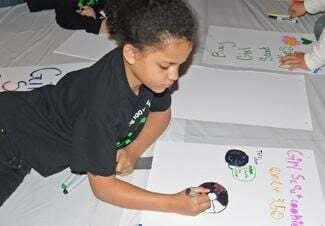 Savannah Odom colors her sign promoting Girl Scout Cookies. At least, it’s time to order Girl Scout Cookies. For the next two weeks, girls from across the Girl Scouts Heart of the South region will be taking advance orders for the sweet treats. If you don’t get a chance to place an order before the Jan. 30 deadline — don’t worry. Area troops will have plenty available at booth sales. “The cookies will be delivered to us in late February and booth sales will begin Feb. 24,” said Jenny Jones, marketing director for the local council. For folks who don’t know a Girl Scout, the organization has gone high tech. “There is even a cookie locator ap for smart phones,” said Jones. “Just go to the ap store and it’s easy to find. It will give you a countdown of how many days left until booth sales. Cookies are $3.50 per box. In addition to the standard flavors, there will be a new cookie this year called Savannah Smiles. The crisp, zest lemon cookies honors the town of Savannah, Ga., where Girl Scouts were founded in March 1912 by Juliette "Daisy" Gordon Low. Even if someone doesn’t like cookies, they can help the Scouts help soldiers deployed overseas. When ordering cookies, customers can opt to pay for a box of cookies. Instead of receiving the box, it will be included in larger shipments that are delivered all around the world to U.S. military personnel. She noted that if someone wants a box of cookies delivered to a specific soldier, they will have to buy a box and mail it themselves. Local scouts have no control over where the cookies are sent, once they are delivered to the military. To kick off the cookie season, local scouts gathered last Saturday in Saltillo for a cookie rally. The girls moved around the Extreme Kids building, going from station to station. In addition to fun things like climbing a rock wall and face painting, there was also an educational aspect. Girls were quizzed at a trivia station, testing their knowledge of the cookies, flavors and packaging. Another station simulated booth sales and forced the girls to make change, using Monopoly money, in simulated sales.